I have a question to ask. I recently brought some love me powders from LM. There is a women whom I've been friends for a long time. I had tried calling her, yet there is no answer or anything. I even tried myspace yet she is off and on. I recently saw her library on the weekends. I tried to give her my new address becuase I had movd but she was in a hurry becuase she had to worl, but she will come next weekend at the library. I wrote down my new address with my contact information. My question is how do I use the powder with my contact information to get my friend to talk to me more and keep in touch in without her even knowing? I'm not sure if I've misunderstood your question, but if you only wish for her to be more "friendly" to you, Love Me powders wouldn't be quite suitable- they are more for relationships rather than friendships. Do correct me if I'm wrong, though! Lightly blow the powder onto your address card and give it to her when you see her next. As far as using Love Me for a friendship situation -- if you state your prayer for respect and friendship while you apply the powders, it should be effective whether or not the love is sexual or platonic. Yea, I've used Love Me oils on items that I'm wanting to sell, so that people will like them. I trust they weren't feeling sexually towards my stereo equiptment, but I guess if they're buying they get to do whatever they want with it! Thanks although it is funny. I was about to ask about the love me oils would they be good to touch all 4 concers with love me powder would both be a very good mix to give my friend the letter? Now tomorrow is the big day when I give my friend my letter with my contact info on it. Once she touches it the front and back what would I see happen in front of me would it be an instant or would it take some time? I finally give my new address and phone number to my friend. it was covered with the love me powders and I gave it a touch of love me oil on all 4 sides of the corner. she was happy when I gave it to her. I told her that I'm going to call her on Sunday, yet she was going out of town for the weekend. She did told me to call her. What will happen next she did touch the paper while she was reading my new address and phone number. Any thoughts will I see "more" of her as time goes on? just curious that was one of the biggest thing I had to do and now I feel a lot better. Well, different people react differently to specific products- she might just think very well and fondly of you, but not contact you. If a length of time passes without her contacting you (and you'd like her to), you could try doing a "contact me" spell. Don't stress about it too much. She was there to meet you when she said she would be, she was happy when you gave her your contact details, she touched the powders. Awesome. Things are going well. Just relax and let the magic work. Call her later in the week and ask how her trip was! Monday can come across as a little desperate... Try Tuesday. Take it easy and enjoy this time. 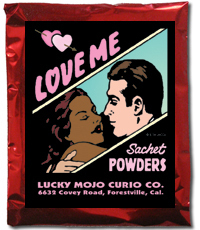 Can I use Love Me sachet powder to attract the man if he is living at another state? Or I need to use it only when I see him? You can dress a letter to them with the powder and send it. The problem is he is living with his wife and 3 children. Surely we don't want one of them to open it and it attracts them instead of him to me? Well first off, unless it's your intent to attract his wife and children to you, it won't. 2nd off if he's living with a wife and family, you might want to look elsewhere for love. It's easier than ripping a family apart even if he says he's "unhappy." Have you gotten a reading yet? Your situation is complex enough that just straight forward product advice isn't going to get you too far. You need to find out if divorce work is possible, if you are willing to work it, how to go about it, then how to work on bringing him to you. All this can be discussed with a reputable reader here: www.readersandrootworkers.org. I have made the payment to Miss Cat and emailed her if we can arrange an email reading. I am still waiting for her to reply. I emailed Miss Bri today in case Miss Cat is too busy and hopefully I will hear something. Miss Bri is really good and I highly recommend her, Starr is also very good. It's hard to compare the 2 because they were each for 2 very different things and different lengths of time but either one is a fantastic choice. Both are wonderful readers. I'm not sure if email is one of the ways you can set up appointments with her so you may want to call the shop tomorrow, but I may be mistaken. Miss Cat and Miss Bri are talented readers and rootworkers who can help you learn more about what is going on and help you decide what to do in order to change things in your favor. Yep I plan to call into the shop tomorrow to make the appointment with Ms Cat. I have read her testimonials and her information. I can sense she is a wonderful readers. You are correct I think I should ring to set up appointments . I just got some Love Me Powder & oil and I am getting my target a ring as gift. I was thinking of anoiting the ring and the box with the oil and powder before i give it to him in hopes that when he wears it his love for me will grow. I feel like its a good idea but I am worried that the powder and oil wont last on the ring for long. Is annoiting it once before giving it good enough? Does anyone have any more suggestions on how to trick the ring to keep working? thanx! I would smoke the ring in appropriate incense while praying over it as well. Also, if you think they will keep the ring in the box when they are not wearing it, you could make a small packet with the oil and powder folded inside a petition paper and stash that inside the box where it won't likely be found. thanx Devi! Ill try that too. Do we have to pray or chant before we use these "love me" , "come to me" ect ect oils??? While the root workers at Lucky Mojo always pray over their products, Yes, you should always do that also (for more power). Then, state your intentions. Thats mean I have to chant again after I receive luckymojo love oil??? Chant, pray, state something. Whatever you fell comfortable doing. Again, everything from Lucky Mojo has been prayed over. YOUR statements add extra power. I was wondering if I anointed a love me candle & wanted to use love me sachet powder & spinkle on outside of the targets front fence. Which comes first the candle burning or the sprinkling of the powder? Also should I circle the candle with the same love me powder that I wish to dress a holiday greeting card? You can do either one first. Some people like to start the work directly on the target and then back it up with the candle work at home. You can absolutely circle the candle and dust the candle with the powder at the same time. Dressing a greeting card with powder is a traditional way to deploy a trick to another person. If you're going to sprinkle powder at someone's house, make sure you blend the powder with local dirt first. That way it blends in and the target won't know you're working on them. Sprinkle the dirt powder mix around where the person will walk. 1) Foot track workings are central to African American folk magic. Read more here in my free online book, "Hoodoo in Theory and Practice"
2) Always blend sachet powders with dirt to make them invisible. Pray your intent over them as you do so, either from your own thoughts or using an appropriate Biblical Scripture. "The Art of Hoodoo Candle Magic"
Can I mix this with Dixie love and graveyard dirt to blend it so it is no to noticeable.. Also can I sprinkle it on the targets door mat.. I would not use graveyard dirt for that unless it is from the grave of someone who loved you in life and would want to help you with your love spells. To help a powder blend in to be less noticeable, use dirt from your target's area. This would be the better way to work. I used regular dirt mixed with a Lil grass, I sprinkled on his door steps will that have the same effect if he step in it? How many times do I need to throw it? And should I back it up with a candle if so what color..I know that's a lot of questions.. Yes that will work. You can throw it as often as you wish (it does tend to dissipate if there's wind, etc.). You can back it up with a red candle. Since I am familiar with your case, I would recommend pink candles for this guy. Miss Aida I soooooooo love you... You are everything... I'm going to email you today and fill you in... He is really a piece of work. I want to use this Satchet powder either on the ground where he steps before entering his truck or use it on his trucks door handle where he would touch the powder. How can I go about putting it on his door handle without making it noticeable and without his truck alarm going off? Also as I am sprinkling the powder do I say my intent? Mixing it with dirt is a great way to 'hide' powders. You could lay it just outside his truck door, you can use it on the truck foot bar, if his has one, that is used to hoist oneself up in the truck. If your wanting to get it on the door, I would probably suggest mixing with a bit a dirt (hopefully his truck isn't spotless!) and blowing it toward the door. Don't have gravel or anything in it that will cause scratches! Unless you jostle the vehicle or attempt to open it, I doubt the alarm will go off. Yes, as you do any of these, simply state your intent. I am planning on putting this powder in front the driver side door of my ex’s truck or on the door handle. 1. How can I go about putting it on his door handle without his truck alarm going off? 2. Will the powder still work if he steps in it with his shoes while it’s on the ground? 3. Do i need to say the intent when pouring it? 4. How much should I pour? You already asked these questions and received answers from RevJames. If you do not come back and READ the answers, we cannot help you. Board warning sent -- not to be mean, but because Carebear27 needs to stop wasting our resources. LOL! My apologies for singling you out. The system does send mail notifications but often the recipient's spam-blocker tosses them, into the trash unread. The best way to check your own posts is to click your name, then click on "Search User's Posts" -- and all of your own posts will show up, with the newest at top. You can search any other user's posts the same way, by clicking their name. Much of this is moot now, however, since, with your third post, you are now a Forum USER and not just a VISITOR, so your posts will automatically go online live. Thank you so much still trying to get use to everything on here. I am excited to try the powder. I am hoping to do it before snow comes. And also if I do this at night when he’s in his house, will it be ok on the ground until morning when he steps in it when getting in his truck he’s going to work? You can sprinkle on snow but be careful that it does not show on top of the snow. Some of the powders and a color to them and would stand out on white snow. Also it will melt into the snow. Also be careful not to leave obvious foot tracks around his truck in the snow, want to be discrete. You can lightly dust his car handles. I think your really asking is it ok to sprinkle at night for him to step in it in the am, the answer is yes.